Editor’s Note: We are re-posting this piece that originally ran in June 2016. With the newest season of OITNB launching this Friday, the post’s original author (Apryl Williams) reports that she has found no evidence of increased racial diversity in the OITNB writer’s room. In light of this, the message of her essay bears repeating. Orange is the New Black’s newest season demands to be binge watched with its notorious twists at every episode style. When it came out on June 17th, I began my annual binge session and had completed it by Saturday, June 18th. If you haven’t heard, the series delivered “The mother of all finales” at the end of this season. As I mourned the death of a major black character, I found myself simultaneously mourning the real deaths of Eric Garner, Sandra Bland, Freddie Gray and the list unfortunately goes on. The stylized portrayal of a death in prison custody at the hands – or knee rather – of a white correctional officer was unmistakably close to Garner’s “I can’t breath.” Though those words were never uttered, anyone who has kept up with news in the last year would find haunting familiarity in the fictional inmate’s all-too-real gasps for air. With her small frame and spine gradually being crushed by the full weight of the white correctional officer as she tried to breathe but failed, the imagery was almost too painful to watch. But I had come this far, I had to continue. At the end of the season, instead of falling into my usual “showhole” syndrome, I was angry and emotionally distraught. This had a visceral, personal effect and nobody warned me it was coming. As the other inmates grieved the death of their friend and urged those in charge to move her body, I wondered who was responsible for writing these scenes and this episode. Surely, a person of color would have cautioned against such tactics without ample viewer preparation. It appears as though the perspective of black viewers was not taken into consideration; a likely result of the limited representation we have in media production. Then I realized that to a white audience, a warning would not have the same meaning or importance. Black presence in the writing room would have not only shaped the outcome of the episode (more on that later), it would have also pointed out the obvious misstep of writing a sympathetic baby-faced, murdering correctional officer into the role befitting of “#bluelivesmatter”. The end result, with the head warden supporting the actions of a “good kid” who simply made a mistake does more to highlight the privileged space in which Netflix and the writers of OITNB exist. They are free to portray injustices such as transphobia or privatized prisons when it is convenient for them. And they do so in a manner that is comfortable and palatable for a mainstream audience. Instead of drawing attention to the all-encompassing police state in which people of color live, white writers of OITNB portrayed the death of a black prison inmate in a manner that is similar to the carnivalesque spectacle associated with lynchings of the past. Lynchings were a leisure time activity that served dual purpose: to show the superiority over the physical corpus of blacks while simultaneously reinforcing the status quo, demonstrating to black Americans that they had little agency. 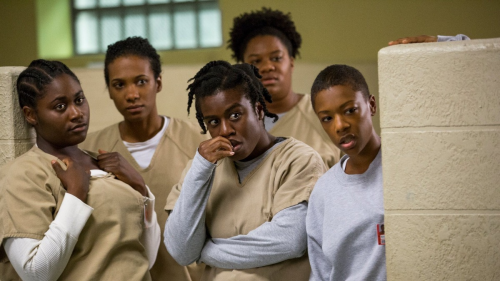 Without influence from Black Lives Matter activists or black writers, the season 4 finale of Orange is the New Black operates in a similar fashion. Let me be clear, Netflix and the OITNB writers do not occupy the same space as a lynch mob, however, the effect of white dominated narrative coupled with the portrayal of black death on television have a similar result: black deaths and pain are harnessed for entertainment purposes. If Netflix is our town square, then we have all gathered to watch the spectacle. As a black viewer, I watched and re-lived the shared pain that black people have experienced for centuries but in recent memory, over the course of the past two years with what seems like continuous news coverage of yet another death of an unarmed black person. To make matters worse, after the death, theatrics did nothing to ease the pain of remembrance. The body was left on the floor of the prison cafeteria for days, drawing obvious parallels to Michael Brown’s death as his body lay in the summer sun for hours after police had shot him. The public relations officials warned Caputo, the warden, not to call the victim’s parents, the police, or the coroner until they had the right angle. The crass humor with which these two men tried to dig up “thuggish” pictures and dirty laundry were intended to serve as comic relief. However for me, and probably for a lot of other black viewers, this was just another reminder of the victim blaming that is typically spread by media coverage. Netflix and the writers of Orange is the New Black are telling our stories but from a white perspective. In the scenes and in the writing room, white writers control the narrative. Perhaps input from a black writer (or better yet, multiple black writers) would have resulted in a story line that honored the deaths of black people at the hands of police instead of one that reiterates and upholds the dominant framing. Black Lives Matter activists may have recommended that the writers highlight the complicated web of systematic and militaristic policing of black and brown bodies that lands them in prison where they are rendered almost powerless. I recognize that Netflix and the writers of OITNB may have tried to reveal injustice by portraying it in a raw and brutal way, as is typical of the show, but as it stands, watching the narrative play out feels as though white writers are exploiting black pain for the intrigue of white viewers without regard for those of us who actually live this experience. This is not the first time the writers have betrayed the moral emptiness of their good intentions. A show that prides itself on shedding light on social issues like prison reform films at a prison where the actors can’t even drink the water because of a leaking sewage problem. The true conditions with which prisoners live in the actual prison where the show is filmed are too graphic for television. Former inmates talk about rivers of feces that flow into their rooms at night. Real people live in this prison that the actors and producers leave at the end of filming. Piper Kerman considers herself a prison reform activist and yet, as a producer of the show, continues to allow filming rather than demanding that the people living there receive better living conditions. My point here is that we watch the fictive stories of women living in similar conditions from the comfort of our homes at times being lulled into a false sense of ease concerning the quality of life of the real people represented by the story lines. Similarly, the season 4 finale makes a spectacle of death at the hands of correctional officers without paying homage and respect to many that have lost and will continue to lose their lives. Watching these narratives on screen for many black Americans serves to reinstate the fear that we live with on a daily basis; knowing that at times, we cannot protect those we love. Apryl Williams (@AprylW) is a doctoral candidate in the Sociology Department at Texas A&M University and series co-editor of Emerald Studies in Media and Communications. Her current research explores black resistance through social media.